When not singing lead and playing his trumpet with the ever popular Shem Creek Boogie Band, DJ Majik Mike makes himself available as one of Charleston's top DJs and MCs. This Florida boy has called The Low Country his home for many years as evidenced by his "Southern Charm" and attention to pleasing all audiences. 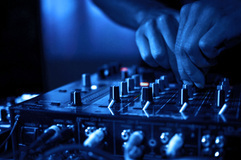 DJ Majik Mike is a true professional who can make your event one you will never forget!